Home » Food and Nutrition » Omega-3 Supplements Gone Bad: Is Your Heart at Risk? Omega-3 Supplements Gone Bad: Is Your Heart at Risk? The fish oil industry is booming. Don’t believe me? The industry is worth about $1.2 billion annually in the U.S. as health conscious consumers (perhaps like you!) try and boost their omega-3 intake. But are fish oil supplements as safe as you think they are? There is no question about the health benefits of omega-3 fatty acids. They can improve cardiovascular and brain health, and might provide assistance in a number of other areas, too. DHA—an omega-3 exclusive to fatty fish like salmon, mackerel and sardines—is the main driver of these benefits. Most of the research, however, indicates that these benefits come largely when omega-3 is consumed in its natural state. Omega-3 fish oil, like other polyunsaturated fatty acids, can oxidize and become rancid. Oxidized fish oil has a reduced potency of EPA/DHA. 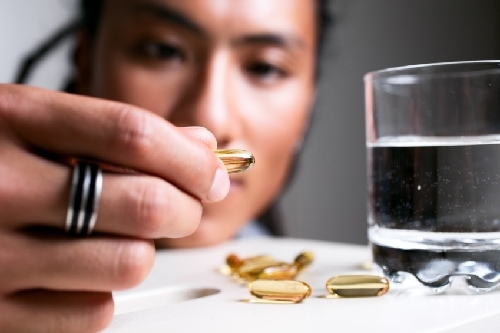 So what about rancid fish oil side effects? I am not saying you should completely abandon fish oil supplements. In fact, I take a fish oil supplement every single day. The jury is still out on the effectiveness of these supplements, but they are unlikely to cause any harm. And the fact that omega-3 supplements are relatively inexpensive and are not dangerous (most of the time)—I believe the reward greatly outweighs the risk. The supplement industry, in general, is well run. Although it is not subjected to FDA standards, there are agencies in place that encourage certain manufacturing standards and quality control. But like with any industry, there are good guys and bad guys. Some companies adhere to standards and produce high-quality products that are subject to third-party tests, while others simply rip people off. Recently a team of Canadian journalists took a closer look into the supplement industry, including fish oil supplements, and they discovered that some supplements might not be all that they’re cracked up to be. Omega-3 fish oil, like other polyunsaturated fatty acids, can oxidize and become rancid. When they do, they might not be safe to consume. The scary part is that it’s very hard to tell when they do become rancid. Fish oil can be very hard to stabilize; therefore, storage is key. Exposure to elements like light, heat and oxygen can degrade the oil, resulting in oxidation. Out of the seven brands tested by journalists, four had evidence of oxidation. One brand in particular had twice the allowable limits for oxidation. Because storage and exposure to these elements is so important to the maintenance of fish oil, and other multiple bonded fats, these products can oxidize and turn rancid long before the expiry date listed on the packaging. People take fish oil supplements as a defense against heart disease, diabetes and cognitive decline. They are a big part of the Mediterranean diet, and research has continually shown that diets high in fish translate to better health. If you have high blood pressure or other cardiovascular problems, however, rancid fish oil can actually be dangerous. There is some research indicating that oxidized fish oil supplements can actually lead to atherosclerosis, organ damage, inflammation and cancer formation. Although these results have been found in animal studies and not humans, they should not necessarily be ignored. More studies still need to be done to see how oxidized fish oil supplements may impact humans. Perhaps part of the reason research on fish oil supplements are contradictory is because some studies don’t use fresh supplements. This has serious potential to sway the results. Know what to look for when you buy fish oil supplements: For example, if it is featured on a shelf in a store that is exposed to lots of natural light (i.e. close to a window) or high up on a shelf where it’s exposed to intense heat and light from overhead lights, then I wouldn’t buy from that location. Find another store that displays their fish oil supplements in a manner that’s more likely to keep the ingredients fresh. Finally, some manufacturers package their supplements in dark or amber glass bottles, which is important when storing light-sensitive supplements. So I’d recommend choosing those bottles over the competition. Read the label: Some brands submit their products to third-party tests to verify purity, and those ones can typically be trusted. To determine if the supplement maker is legit, look for the NSF (National Safety Foundation) and GMP (Good Manufacturing Practices) labels. Proper storage: Once you get the product home, place it in a cool, dark place, like a lower-level cupboard. In some cases, if it’s a liquid, use the fridge once it has been opened. Pay attention to cloudiness or any strange flavors as you begin to use it. If you do purchase liquid fish oil supplements, I recommend buying the smaller packages, because the bigger packages are more likely to oxidize before you finish them. Finally, I’d like to remind you that fish oil supplements are just that: supplements. They are part of the big picture when it comes to heart and brain health. They are very useful as part of a healthy diet and lifestyle that includes fish, vegetables, whole grains, healthy fats and exercise. Albert, B. B., et al., “Oxidation of Marine Omega-3 Supplements and Human Health,” BioMed Research International, 2013; doi:10.1155/2013/464921. O’Connor, A., “What’s In Your Fish Oil Supplements?” New York Times web site, January 22, 2014; http://well.blogs.nytimes.com/2014/01/22/whats-in-your-fish-oil-supplements/. Griffith-Greene, M., “Omega-3: Why your fish oil supplements might not be fresh,” CBC News web site, last updated November 20, 2015; http://www.cbc.ca/news/health/marketplace-fish-oil-omega-3-benefits-safety-1.3326587, last accessed November 23, 2015.